I was asked to Review the White Chocolate Lenny Lamb from Thorntons for Izziwizzi Kids, you can see me in full video reviewing glory here! But I thought I would also tell you a little bit about him too! 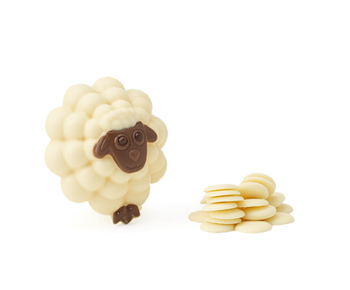 Lenny is a White Chocolate Lamb with Dark Chocolate decoration, he also comes with a side helping of white chocolate buttons. Normally I wouldn’t choose white chocolate, I don’t dislike it but dark chocolate is my favourite and I would pick milk over white too! So this was quite a test for me, and I liked it! The chocolate was nice and smooth, it was sweet without being too sweet and as you can see Lenny is very cute!In fact hubby and I claimed Lenny as ours – the kids can have the buttons! He is a perfect alternative to an Easter Egg for the kids this year and he is also on offer over at Thorntons website now in the form of 3 for 2!